We all face situations when our heart is broken and it hurts a lot, and then we are devastated and we don’t know where to go and what to do to ease that pain. Here is a collection of Love Hurt Quotes that might help you feel better, regain self-confidence, and move on with your life. When you feel you don’t deserve to be treated so badly remember that the person who broke your heart did not deserve your love in the first place. Being hurt is one of the ways to find your strength. Never hold on to the people you love. If they love you as much as you love them, they’ll stay with you no matter what. If they don’t, you’d better let them go as soon as possible. No love, no broken heart. But so amazing love is that is it worth suffering. When someone you care about tells you they don’t love you and it hurts, realize that it is not that bad: learning that from someone else is. My true love, I love you so much it hurts! Don’t think that those who hurt you once won’t ever hurt you again. When you push someone off, don’t expect you’d be able to pull them back. If you feel like you always give and never get anything back, check out the ones whom you give: something must be wrong. Losing a loved one is not what hurts the most: it’s wishing them back that does. A relationship is like a rubber band that two people are holding: letting go of one side inevitably hurts the other. Breaking up only hurts if you two were once connected. And, like with any other kind of breaking, it doesn’t feel the same however hard you try to make it right again. When you are heartbroken and hurt, don’t blame the other one, no matter how angry and devastated you are. Instead, think about all the good things you’ve had together and all the valuable experience you’ve got now and how you’ve become a different person (and that will hurt even more). Then, let it go and never think about that ever again. The more you can change your life after your heart was broken, the faster it stops to hurt. Being hurt by others doesn’t mean you should hurt yourself, too; being rejected doesn’t mean having to reject yourself; it’s not your fault. It means it’s time to thank them for the time you’ve had together, push them aside and move on. How do you tell it’s a true love? Have this person betray you, realize it hurts too much and it’s way too late. You are asking when it stops hurting. Sometimes it never stops, so learn to accept this pain, live with it, make it a part of you. How can you tell you’re alive if you don’t feel pain? How can you tell you have ever been happy? Never mind the ones who hurt you and broke your heart. Mind the ones that mended it. Was there a way for this person not to hurt you? Probably not; it’s either you or them, and everyone should care about themselves more than they care about others, otherwise it’s counterproductive. You’ll hurt and you’ll be hurt again, so what, just move on and enjoy life. Staying or letting go? Sometimes it hurts either way, so just make sure you make the right choice. Kids don’t lie. It’s when they get scolded and punished for truth that they start lying. Relationships work in the same way: either you accept the truth or prepare for lies. Just remember that however much the truth hurts, a lie hurts more. 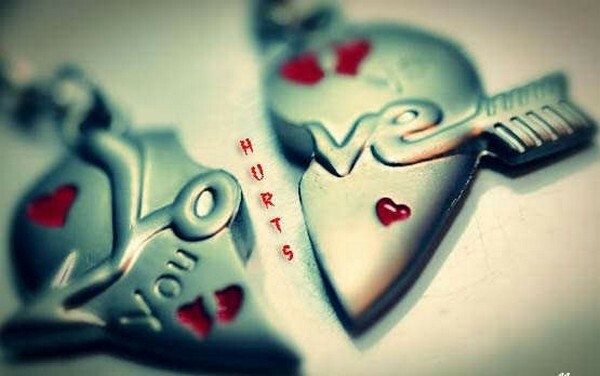 Love Hurt Quotes…When someone hurts you, you get that empty feeling that only love can heal it. Read these love hurt quotes that we have collected just for you. You will never forget; you will remember from time to time, and it will hurt you over and over again. You can wallow in pain and anger for years… But if you move on, it won’t seem important anymore and it will only hurt a little bit. The only way to make love last forever is to not to classify it as love. Embrace your pain, for it was given to you on purpose. Stay with it, think about it, deal with it, and it will make you stronger. Don’t push it aside or wish it away. You will love again, and this will be better than ever before. Distance is as powerful as time in healing a broken heart. Your heart doesn’t hurt, it’s your brain that does. There is something that wounded birds can teach us. If they are picked up by someone and nursed back into health, they fly away or they die, there is no third option. It’s how hard you work on your love, how much you sacrifice, that makes it last longer. This hurts, too. When we look back, it’s usually someone’s words that have broken our heart, but as much as words hurt, they can also heal. Understanding takes up all the space in your heart, and there’s no room left for pain, anger, or fear. If you want a painless relationship, you should always accept and never expect, which means fighting your very human nature. Can you do that? In the end, the only closest and most valuable friend you have is yourself, and the great thing about this friend is that you can make sure they will never betray or hurt you. Unless you choose that, of course. The bad thing about anger is that it hurts you more than the ones you are mad at. The good thing about it is that it can mean positive changes to you. It’s all about you, really, and never about others. A happy life is not interesting. All expression, art, is ultimately about being hurt. Being hurt when you lose something is how you know you’ve loved it and needed it. Every time you are hurt like this, take a moment to think what you can appreciate now before you lose it. When you are heartbroken, try to remember that happiness does not come from other people, even the ones you love, but from you. It always has, even when you were together. So you have what you need to be happy after all, don’t you? If you have a functioning body, you’ll move it, and you’ll feel the world. This is called living. If you have a heart, you’ll get hurt eventually. That’s called feeling. There’s no way you can change until you get uncomfortable enough with the current state of affairs. Hurting is how life gives you a signal that it’s time to change; embrace this signal, because if you don’t, there will be more signals. If you think you are unique with your pain and broken heart, look at others: sometimes you see, sometimes you don’t, but no one is spared. It hurts for everyone. The only difference is the choice these people make, how they deal with this pain, but this is a world of difference. If it hurts so much nothing helps, just let Time pass right through you to heal you and wipe your tears away. Or, better yet, have the Distance separate you from whatever hurt you, and you shall be right again. Changing your appearance or habits won’t help if the person you want doesn’t love you. Finding another one helps. The worst kind of loneliness if being surrounded by many people who like you but not loved by the one you love. Being heartbroken is like standing in front of a fire on a cold night: it is so bright that you can hardly see anything else. It’s only when you step aside that you can see other, possibly better, things, but it takes courage to accept the cold and the darkness for a while. Before falling for someone, make sure they are there to catch you. Losing a friend hurts, but this is the price you pay for growing up. When you lose someone you love, the hardest part is to fill the smoking hole they’ve left in your heart. Love is blind, and it has got to stay blind: finally seeing your partner for what they are usually means it’s over. It takes wisdom and maturity to tolerate people hurting you and hot hurting them back, but trying to understand. You are hurt for two reasons: first, you need to learn; second, the others need to learn. You can’t stop others from hurting you, but you can at least try to stop yourself from hurting others. That means less pain and a better world. Striving for success is about risk and eventual failure. Love is about being exposed and eventual pain. Yet people pursue both of them and become happy. Back when it all started, you knew this love won’t last forever, and you knew breaking up would probably hurt, and it finally did. But wasn’t it worth it, all the moments together, all the happy feelings, all the inside jokes and romantic experiences and all the pleasure you’ve had? If it wasn’t, it wouldn’t hurt so badly. Don’t make the mistake of becoming a slave of your memories, though. Instead, look for new experiences to surpass the old ones. Letting others down is for some people a way of saying they don’t deserve the love they are shown. When you are rejected by someone you loved, it doesn’t mean that you’re not good enough for them. Sometimes it just means you’re too good and deserve an opportunity to find the one who will be good enough for you.